Woman to Woman: Day 5 of Holy Week! Day 5 of Holy Week! Today is Maundy Thursday. It is day 5 of the Holy Week. It was on this day that Jesus served His disciples by washing their feet before their last meal together. Peter would declare that Jesus would not wash his feet because he wasn't worthy to have the Master wash him. Jesus told Peter that "unless I wash you, you won’t belong to me." Peter relented and let Jesus wash him. I think I would be like Peter. I am not worthy to have the King of Kings and Lord of Lords wash one toe much less both of my feet! Yet, if Jesus were to say the same words to me that He did Peter, I know my response would be the same..."then wash my hands and head, too, Master!" The disciples had no way of knowing what a weight Jesus was carrying! Can you imagine knowing that this is the last time you will gather to fellowship with your closest friends on this earth? Can you imagine knowing what lies ahead for you ... just some 24 hours or so ... that you will endure a horrific amount of pain and suffering? There is only one time where we see a small glimpse of the humanness of Jesus. In Matthew 26:39 NLT we read Jesus' words, "39 My Father, if it is possible, let this cup pass from me. Yet not as I will, but as you will." Who could blame Jesus for wanting a way out if it was possible! Yet, he ended the plea to God, the Father by saying 'not my will, but yours.' Jesus would have done anything to be the one final sacrifice for God's children!!! That's a whole lot of love!! I pray that I can love like that! Just a short time later, the soldiers come. Judas betrays the King of Kings with a kiss. Jesus is arrested and tried in a mockery of a trial. And in the end, Jesus is crucified because of peer pressure. Pilate found no fault in Jesus. He wanted to set Him free. But because of the pressure of the crowds, he relented and ordered Jesus to be crucified. The prophecy had been fulfilled! All of heaven turned their back on Jesus as He freely gave His life for us. Oh, but aren't you glad that the story doesn't end there!! On the third day, just as He had said, He rose from the dead!!! He's alive! He's sitting at the right hand of the Father making intercession for you and me. He makes sure that God sees the blood of His son covering our sins. Praise God!! As you move on through this Holy Week, remember the real reason we celebrate Resurrection Sunday. Remember that Jesus died on that cross with YOU on His mind!!! 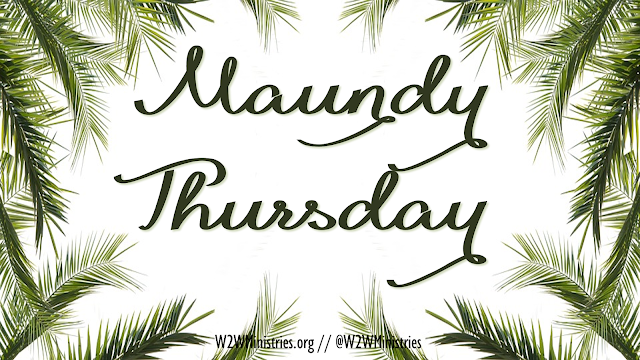 Have a blessed Maundy Thursday! !